Gyotaku is the Japanese word for 'fish print.' It's a technique that dates back to mid-nineteenth century Japan. 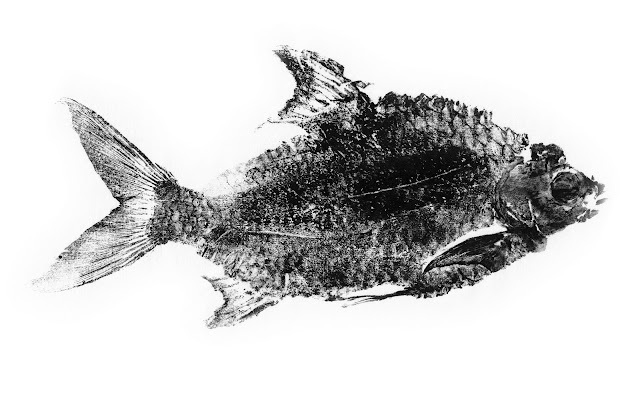 Ink is applied directly to the fish, then a flexible, thin sheet of paper is placed over the fish and an impression is made by lightly rubbing or burnishing the back side of the sheet, transferring the ink onto the paper. The end result is a direct 'block' print of the fish. This craft was originally developed by fishermen to record special catches, but the tradition was eventually adopted by artists. Other media can be used instead of ink, such as acrylic or oil paint. Colors can be applied to mimic the original pattern of the fish or perhaps make a more vivid version of the actual fish. In the case of the ink print above, it's a record of a long lived pet that passed away. I had had a pair of Tin Foil Barbs that started out as very small fish, perhaps about 4cm in length. After many years, John and Megan [the barbs] grew to about 30cm. Tropical fish don't have a long life expectancy, but John and Megan lived well past their expected years. John passed first, then Megan. Upon each of their deaths, I made prints of them both and buried their remains in my garden. I've kept fish for most of my years, but these are the only two fish that I've kept such a record of. This print was made in 2004, one of many, tucked away in a makeshift cardboard portfolio and nearly forgotten until today when I was looking for something else.